Miso is a fermented soybean and grain paste that comes in a wide variety of flavors, colors, textures, and aromas. It is popularly used in Japanese cuisine in dressings, for pickling, as a spread for grilled foods, and as a base for soup. All miso falls under three basic categories: komemiso, miso made with rice and soybeans; mugimiso, miso made from barley or rye and soybeans; and mamemiso, miso made from soybeans alone. Miso is produced by crushing boiled soybeans and injecting them with a yeastlike mold cultivated with a barley, soybean, or rice base. The mixture is then allowed to mature from six months to three years. The darker the miso, the longer it has been fermented. Darker miso, which is saltier and stronger, is used in more robust-flavored dishes. The lighter-colored varieties are generally used in more delicate soups and dressings. Miso is a fermented soybean paste whose salty taste, buttery texture and unique nutritional profile make it a versatile condiment for a host of different recipes, including traditional miso soup. In addition to soybeans, some misos also feature rice, barley, or wheat. Miso is made by adding a yeast mold (known as "koji") to soybeans and other ingredients and allowing them to ferment. 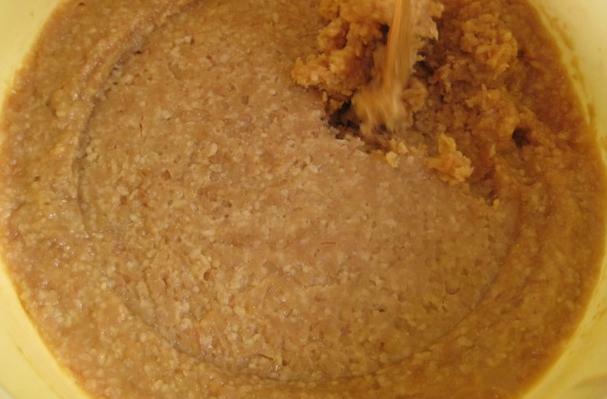 The fermentation time, ranging from weeks to years, depends upon the specific type of miso being produced. Once this process is complete, the fermented ingredients are ground into a paste similar in texture to nut butter. The color, taste, texture, and degree of saltiness depend upon the exact ingredients used and the duration of the fermentation process. Miso ranges in color from white to brown. The lighter varieties are less salty and more mellow in flavor while the darker ones are saltier and have a more intense flavor. Some misos are pasteurized while others are not. Choosing: Miso is generally sold in tightly sealed plastic or glass containers. Some stores also sell it in bulk containers. To check for freshness, look for a sell-by date listed on the container. In addition, check the label to make sure there are no additives such as MSG. Buying: The type of miso that you purchase should depend both on personal preference as well as intended use. As darker color misos are stronger and more pungent in flavor, they are generally better suited for heavy foods. Lighter colored misos are more delicate and are oftentimes more appropriate for soup, dressings and light sauces. History: The predecessor of miso originated in China during the 3rd century BC or earlier, and it is probable that this, together with related fermented soy-based foods, was introduced to Japan at the same time as Buddhism in the 6th century AD. This fermented food was called "Shi". Until the Muromachi era, miso was made without grinding the soybeans, somewhat like natto. In the Kamakura era, a common meal was made up of a bowl of rice, some dried fish, a serving of miso, and a fresh vegetable. In the Muromachi era, Buddhist monks discovered that soybeans could be ground into a paste, spawning new cooking methods where miso was used to flavor other foods. Miso was also used as military provision during the Sengoku era and making miso was an important economic factor for daimyos of that era. During the Edo period miso was also called hishio and kuki. In modern times miso is produced industrially in large quantities and traditional homemade miso has become a rarity.